Recommend a friend and receive up to one month of free services! LET US SCOOP YOUR DOG’S POOP. In March of 1999, Dog Duty was founded in Austin, Texas. The business was primarily run by Lance Reichert using his Ford Ranger, a few shirts and promotional materials, and the sheer desire to succeed. From the beginning, the business quickly began to take off due to its straightforward and inexpensive approach to offering a unique service that customers could not or did not want to provide for themselves. 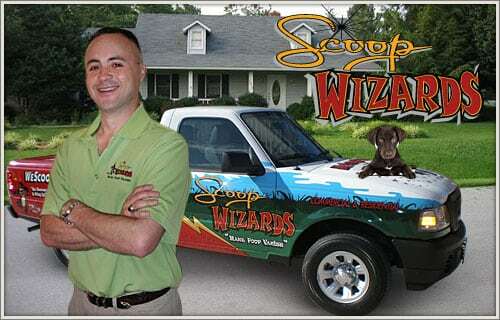 Scoop Wizards offers a weekly Pooper Scooper service. During each weekly visit, we will police your yard, scoop up all the dog poop, and bag up anything we find. We have several options for your yard depending on your needs. We typically charge $75 for each application, but larger properties may be a bit more. We can take the bag with us each visit for an additional $2.50 per week. My dogs go crazy when Carlos comes – I’m so glad he’s able to enter the yard and not be timid around them. They really appreciate the “woofies’ he leaves – but gobble them up before I realize he’s been here. Keep up the wonderful service we’ve become addicted to!! B.J. Q: What do you do with the dog poop? We leave the bag at your house in the roll-away trash can. If you keep your trash can inside your garage, then we leave the bag next to your garage door farthest away from your front door. Get A Quick and Easy Quote Today!